To fully understand the operation of the ATN X-Sight Riflescope, you need to adopt the idea that this riflescope is basically a ruggedized video camera which includes a mounting system and reticle system. Therefore, just like any video camera, the only way you can utilize the ATN X-Sight is by turning it on. Without the power on, you cannot see directly through the unit because all you are looking at is a black screen. Another thing to remember is that all the features in the X-Sight run off imbedded software (firmware). Fortunately, ATN has provided a way for this firmware to be updated by the user to ensure you have the latest set of features and so that ATN can resolve any issues or bugs. ATN plans to provide firmware updates free of charge and performing an update is very easy. Since the X-Sight is based on user updateable firmware (software), the menus and features can change and be updated over time. I believe this is why ATN elected to furnish the X-Sight with a very basic printed "Quick Reference Guide" instead of a full printed "Instruction Manual." ATN does provide an online Manual that gets updated as they update their firmware. The online manual is fairly comprehensive and provides color photos, graphics and commentary as needed. They also provide a 12 minute tutorial video which is a good introduction to the features. The first X-Sight I received came with the firmware version 1.8.00.169. The literature that comes with the X-Sight indicates that one of the first things to do is update the firmware to the latest version found at the ATN website. Performing the update was simple and the features I describe in this review are related to running firmware version 1.8.06.296. There are a couple of ways to get the updated firmware on your X-Sight. They all require you having a micro SD card. You can load the firmware directly on the card when the card is plugged into a memory card slot on your computer, or you can download the firmware directly to the card while it is installed in your X-Sight. In both cases, the new firmware file "xsight.bin" should exist at the top level on the memory card (not in any sub folders). The only drawback I found was that downloading the file directly to the card while installed inside the X-Sight takes about 4 minutes of data transfer. This is not bad if you consider it still takes effort to load the file on the card the other way. One draw back to the direct transfer method is that you are using battery life during the transfer. Once the file "xsight.bin" is loaded on your memory card that is installed in the X-Sight, the next time you power on the unit, the unit will ask you to "Firmware Update?" If you wanted to update the unit, you would use the Right / Left arrow buttons to select the "O" (symbol inside the screen) and press Enter. The then the unit goes through the update process. If you have already updated the firmware then you would press Enter while the "X" is selected. You must make sure that the batteries in the X-Sight are fully charged before updating your device. In the event of a power failure during an update, the X-Sight may need to be sent back to the factory for service. Once the device has been updated, you will need to do a "Hard Reboot" by unscrewing the battery cap until the unit turns off, waiting 10 seconds, and then retightening the battery cap and turning on the unit again. Once you have updated the firmware, you should remove the "xsight.bin" file from the card. If you don't, the unit will always ask you to update the firmware. If for some reason you have low batteries and someone presses the buttons to update the firmware and your batteries die, then you may be out of luck for your hunt. The user interface with the X-Sight is accomplished by using the simple 6 button keypad shown below. For the purposes of this review, I'm going to refer to the arrow buttons as Forward, Back, Left and Right. Other than navigating menus with the Left and Right arrow buttons, they are also critical to photo and video capture. Pressing the Left arrow button will take a photo (or multiple photos) according to whatever Camera or Capture settings you have set. Pressing the Right arrow button will turn the video recording On or Off. To turn the unit on and off, you must press and hold the Power button for just over 3 seconds. In the earlier firmware releases, I did find occasions where the X-Sight seemed to freeze up and I had to unscrew the battery cap to do a hard shutdown. Based on the latest firmware, I have not seen this issue again. One thing I noticed immediately is that the X-Sight can go through a new set of Duracell alkaline AA batteries very quickly. Once the battery icon was visible indicating low battery, features like the camera or video recording capability were disabled. To solve this problem I started purchasing Energizer Ultimate Lithium batteries and was able to get an acceptable battery life, but at a higher cost per battery. ATN lists the following information on battery life. I also believe that some of the firmware updates have improved battery life to this level because I don't feel I was initially getting the times below for the Alkaline batteries, but do feel like I'm now getting times close to these for the Lithium batteries. One battery saving feature that shouldn't be overlooked is the "Sleep Delay" found under the "Setup" menu. If the device is motionless for a certain amount of time, it turns to sleep mode and then starts again with the slightest movement. This feature can be turned off or set for 1 minute or 5 minute increments for up to one hour. One feature that you shouldn't overlook and should take advantage of from the very start is the USB Power Supply Mode which is accessed from the USB Mode Menu. To access the USB Mode Menu, you must first have a set of batteries installed in your X-Sight and have a USB cable plugged into your Micro USB port on the X-Sight. When you power up the X-Sight, it will immediately go to the USB Mode Menu in the display. Two choices exist on this menu; USB Power Supply Mode and USB Mass Storage Capacity Mode. The Forward and Back arrow buttons will let you select between these two modes. Highlight the USB Power Supply Mode and then press Enter. Once this mode is activated, you are no longer using battery power to operate the X-Sight. To prove the point, I removed the batteries from my unit and the unit continued to operate without issue. If you have your WiFi turned on, the current draw is too great for the USB power supply to work and the unit then switches back to the batteries. This USB power supply mode is potentially one of the greatest features because you can purchase some type of portable phone charger system to use on the long hunts when WiFi is not required and where you may be hunting at night from a fixed position for long periods of time and continually scanning the terrain. I purchased an Xtreme 13200mAh Deluxe Power Bank for about $40 just for this purpose in hopes that I wouldn't go through as many batteries. You can purchase power banks in various sizes and I selected this one mainly for availability (at a local store) and cost. Once the X-Sight is initially powered up and then switching to the Xtreme power source, the unit was able to function even without batteries so clearly this should save some money in the future. I have no idea on run time with this device, but I expect it to be slightly longer than four 3000 mAh lithium batteries costing about $7 per set of which I'm currently on my third set. Too bad there is not a slick option like this to run the IR illuminator which takes two CR123 batteries. One of the key features of the X-Sight is the ability to take photos and video, which for many people may be the trophy you take home at the end of the day. You can get these photos and videos to your computer by either removing the micro SD card from the X-Sight or transferring them directly. To transfer them directly, you will need to access the USB Mass Storage Capacity Mode (to access this mode see the section above USB Power Supply Mode). 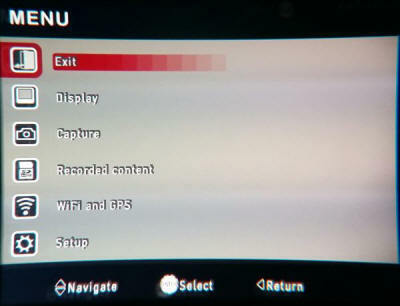 Once in this mode, the memory card on your X-Sight looks like a memory card on any other USB device and you can access it through the file system on your computer. The display includes areas at the top and bottom which are considered to be the Info Bars. When you select information to be displayed on the top bar, it will always be displayed. When you select information to be displayed on the bottom bar, it will only be displayed when you press the Enter button once and the display time is set-able from 1 to 9 seconds. The items that can be displayed on these bars are time, compass heading, speed, altitude and zoom magnification. The display you see when looking through the eyepiece is 800 x 600 pixels. When you subtract the info bars, the actual portion you see showing the video image is 800 x 450 which is a 16:9 wide screen format. The sensor inside the X-Sight is an HD 1080p ATN L130 Sensor. This means that the actual video image being captured should be 1920 x 1080 pixels which is also a 16:9 aspect ratio. If the math works out, you should be able to zoom in 2.4 times (1920/800) before you start seeing any type of image degradation on the screen due to blowing up a smaller image to a larger screen size. Following this logic, the 5-18x model should still give you a high quality display image at an equivalent 12x power (5 x 2.4 = 12). For the 3-12x model, this would be 7.2x power. Again, if you zoom past 12x for the 5-18x model, you will start scaling a smaller image to become a larger image for the screen which will cause you to see some graininess in the image. You may not have realized this, so I want to point out that the zoom capability we are talking about is all digital zoom. This means that the only reason an image looks larger from the original base power is due to digital resampling/scaling of the image captured by the sensor. The optical zoom range for the 3-12x model is 3x and the for the 5-18x model is 5x. The X-Sight units actually have zoom capabilities greater than that advertised. Within the menus, there exists the ability to have the zoom set to "Standard" or "Extended". Limiting the zoom range to the "Standard" mode helps to prevent from having too grainy of an image in some cases, but the "Extended" mode might be nice for certain situations at long range if image/target detail is not critical. 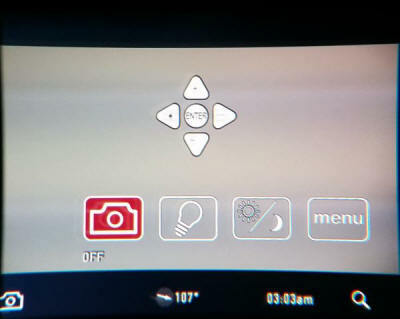 After you load a new version of firmware, you will need to set the "Lens Type" in the "Setup" menu to match the model X-Sight you purchased (3-12x or 5-18x). Doing so will allow you to see the zoom powers displayed on the screen and in the Info Bar. The following table shows the zoom ranges for each X-Sight model in both the Standard and Extended modes. It looks like ATN may be shorting themselves by listing 18x capability instead of the 20x achieved in Standard mode on the 5-18x model. To access the first level of menus, you press the Enter button twice and the screen will display as shown below. At this level, you can access some camera features, overall brightness, day/night mode and the detailed menu. You can use the Left and Right arrow buttons to select a menu feature and then press enter to access that feature. Once you initially setup and zero your X-Sight, most likely the only need to go further down past this level in the menus is when turning on and off the wireless feature to conserve battery life. The camera icon allows you to turn the delayed photo feature On and set the number of seconds delay for the first photo and between consecutive photos to be from 2 to 15 seconds. If you keep scrolling through the number of seconds, you can turn this feature Off. The number of photos taken is actually set in a detailed menu screen. The light bulb icon allows you to change the screen brightness which can also help conserve battery life. The Sun/Moon icon allows you to switch between day and night modes. When in night mode, you can use the Forward and Back arrows to shift between green night vision and white night vision modes. If you do need a detailed level of menus, then highlight the "menu" icon and press Enter to access the rest of the menu features on the X-Sight. The detailed menu consists of Display, Capture, Recorded Content, WiFi and GPS, and Setup. I'm not going to discuss these in too much detail because there is a greater chance that at a detailed level future updates in the firmware could change the screen significantly. Refer to ATN's online Manual for the exact details. The Display sub-menus give you the ability to adjust features such as the Day/Night mode options, Brightness, Reticle, Compass Position, Clock Position and Display Bottom Banner Time. A key feature of this sub-menu is under Reticle where you can select your reticle type and go through the zeroing process. I will cover zeroing in Part 3. ATN is also experimenting with a Ballistic Compensation feature which helps adjust the reticle for your shooting conditions, velocity and distances (for a potential enhancement with this Ballistic Compensation feature see Part 4, Evaluation 1, Item 6). When this ballistic compensation feature includes a more robust bullet drop calculation algorithm, I feel this feature will be a great enhancement to the X-Sight product. 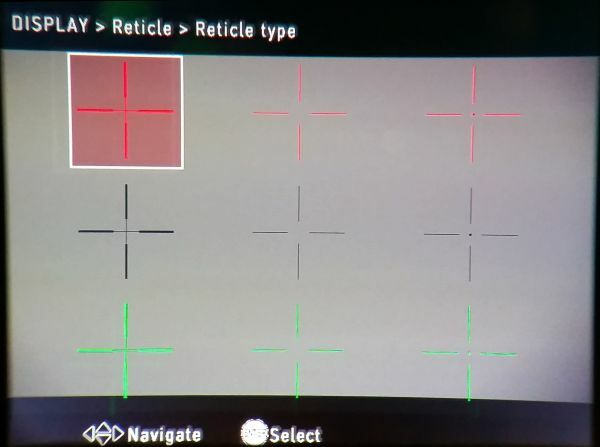 At the moment, the X-Sight comes with the option of three different reticle styles and in three different colors shown below (please forgive crappy photo). This is one area that ATN's ability to update the firmware can allow other style reticles in the future. One feature that I would love to see is for them to develop a way for you to make your own reticle style for a true custom image with custom bullet drop compensation lines. As an option, you can choose not to display the reticle if you are just wanting to capture some photo or video images. The Capture sub-menus give you the ability to adjust features such as the Video Resolution, Microphone On/Off, Timed Photos and Geo-tagging. If you play your videos using Windows Media Player, the default codex that comes with this player may not play the audio recorded in your video file. You can hear the audio if you open the video using Windows Movie Maker which might be installed on your computer. After discussing this with ATN, they recognized the codex difference and suggested using the VideoLAN free VLC media player. I downloaded the free player and it worked like a champ. Since this detail was not formally addressed in their manual and may be interpreted as an issue by the consumer, I feel like this represents an issue and has been identified in Part 4, Evaluation 1, Item 10. This current version of firmware only gives you the option to format the SD card and not the ability to see photos and video directly on your device while in the field (the need to see photos and videos is identified in Part 4, Evaluation 1, Item 5). Although, firmware version 1.8.07.343 give you the ability to view your photos and video using you your mobile device while streaming the data from your X-Sight. This sub-menu gives you the information necessary to setup your WiFi name, password, MAC address and turn the WiFi feature On/Off. This is also where you can turn the GPS feature On/Off. This sub-menu is where you can set the Date / Time, Units, Digital Zoom Range, Lens Type, Sleep Delay and see the Firmware Version. A key feature to the success of this platform is the ability to update the devices firmware. I feel that in some ways, the X-Sight unit was put on the market with the firmware in a beta test version causing the consumers to live with issues prior to them being corrected with firmware updates. The firmware I'm using at this time is greatly better than the first version I initially tried 6 months ago, but there are still issues that need to be ironed out. I'm still a fan of the ATN X-Sight and can see that in time, this will be a great product. Even though I have been one of those consumers who have had to experience ATN working out the issues, I still have no regrets for making the investment and purchasing an X-Sight.